Sometimes we don't realize how close we are to an amazing adventure hidden just out of sight. This Halfway Brook waterfall and natural rock surface water slide is easy to miss, but impossible to forget for those who discover it. Halfway Brook is located in the Cape Breton Highlands, just before Neil's Harbour. You have some options to get to the falls. One method that is said to be preferred by local officials is parking near a small bridge and following the brook until you come to the falls. The walk could be about an hour depending on your fitness and pace. The second option is to find a tree marked about 10 minutes up the highway. Somewhere nearby is an old trail in the woods. It may be difficult to find. However, the trail puts adventurers within a shorter 10 minute walk to the destination. Note: Entering the woods on an unmaintained trail or walking the brook has obvious hazards to your safety. For those who choose to make the hike or slide down the falls, they must keep in mind that they are on a massive rock after all. Slipping and falling or hitting your head can result in very serious injury. There is nobody there to provide medical assistance. 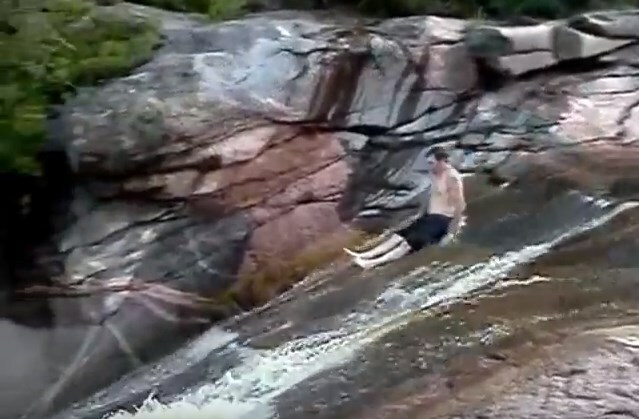 For that reason, sliding the falls is something most may choose to avoid. Put your safety first. Here is one adventurer who marked off the Halfway Brook rock slide from his bucket list. Video by Chad Harnish.